Various core studies were conducted by members of the research team in order to document, describe, and interpret the lithology and gamma-ray (GR) character of Utica/Point Pleasant reservoir rocks throughout the Study area. In addition, this work included an evaluation of sedimentary features associated with Utica/Point Pleasant and equivalent rocks, and sought to refine the stratigraphy of the Utica/Point Pleasant interval in central Ohio. A key element for potential production from Upper Ordovician shales, as with any shale play, is TOC. 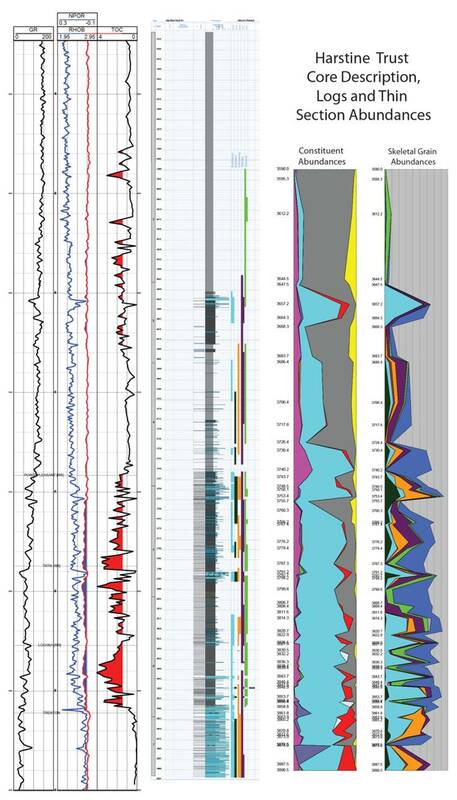 High-resolution photography and spectral gamma-ray (SGR) core logging not only facilitates core descriptions but also provides an opportunity to link wireline log data to rock analytical data such as TOC. Using this approach may help identify a proxy for predicting TOC and/or better constrain chronologic stratigraphy. 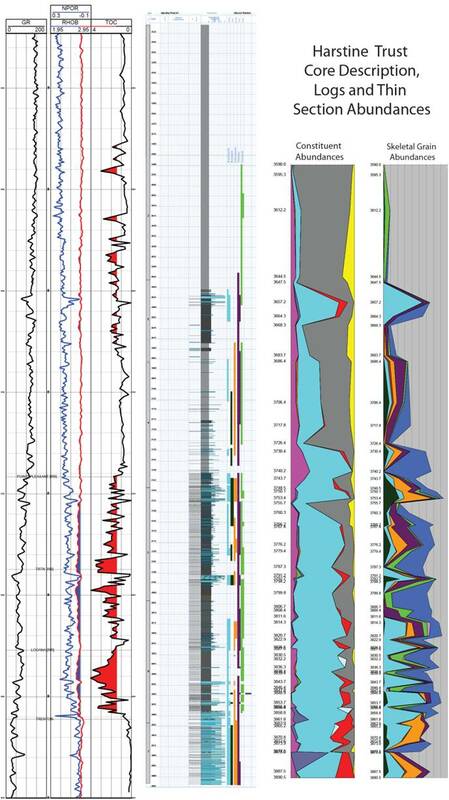 The method of using GR, SGR and density data as proxies for TOC has been performed for other shales in the Appalachian basin (including the Marcellus Shale), and in other basins such as the Alberta of Western Canada (Lunig and Kolonic, 2003). As team lead for this particular task, ODGS reviewed available data on the Upper Ordovician section in Ohio, including core, rock cuttings, paper geophysical logs, LAS files and source rock analyses. ODGS recorded 761 cutting suites, 193 wells with TOC analyses, 68 wells with downhole SGR logs, 58 wells with LAS files and 48 cores. A series of location maps was generated for each data type to determine its geographic coverage across the state. We used these maps to determine where additional data needed to be collected to augment the existing dataset for this task. Although cuttings samples were available from 761 wells, once the availability of preferred logs (i.e., GR, SGR and density run post-1990) was taken into consideration, only cuttings from 15 wells were chosen for TOC analysis. In addition, three rock cores were chosen for analysis. Data from these 18 well locations were added to the legacy database that contained TOC data for 193 wells, resulting in a TOC data count of 211 Ohio wells. Combining these data with data from wells in other states, and additional data that became public during the term of the Study, resulted in a grand total of 382 wells with TOC data. Core sampling was imperative for this work because it provided the most accurate depth values for TOC analysis to incorporate into LAS logs. The cores chosen by ODGS were strictly based on geographic location, additional available data and overall condition, with little priority given to age and/or availability of modern logs because the core could be scanned as part of the present work. Prior to any sampling or scanning, high-resolution photographs were taken using a Nikon D700 camera. This provided a permanent visual record of the core in its initial condition. Each photo image file was named based on the core footage, box number and whether the core was wet or dry. Once a core had been photographed and archived, it was scanned using the Core Lab SGL-300 Spectral Gamma Logger (SGL-300). The SGL-300 is owned by The Ohio State University’s Subsurface Energy Materials Characterization & Analysis Laboratory (SEMCAL) and is housed at the ODGS Horace R. Collins Laboratory (HRC). It scans core at high resolution and creates LAS geophysical logs of GR, uranium-free gamma-ray (UFREE and KTh), potassium (POTA), uranium (URAN), thorium (THOR) and bulk density (RHOB). These logs allow geologists to accurately correlate core with other physical data. The SGL-300 is calibrated daily to a set of standards to ensure the production of accurate and consistent data that can be directly compared to all other core scans. Core is scanned continuously from bottom to top at a rate of 6 in per minute when gathering SGR data and 3 in per minute when measuring RHOB. Information for each data type is recorded every inch, but in order for the SGL to create a "geophysical log-like curve", each data point is based on a progressing average of the previous 6 in of scanned core. In a single day, the maximum length of core that can be scanned is either 300 ft for SGR or 150 ft for RHOB. Cores in excess of these lengths require multiple days of scanning, which also requires recalibration and stitching together numerous LAS output files. To accommodate a seamless LAS merge, each subsequent scan began by rescanning the last 10 ft of core from the previous day. A total of 14 cores (eight from Ohio, three from West Virginia, two from Kentucky and one from New York) were photographed, scanned and converted to LAS files. No Pennsylvania core samples were available for this task. 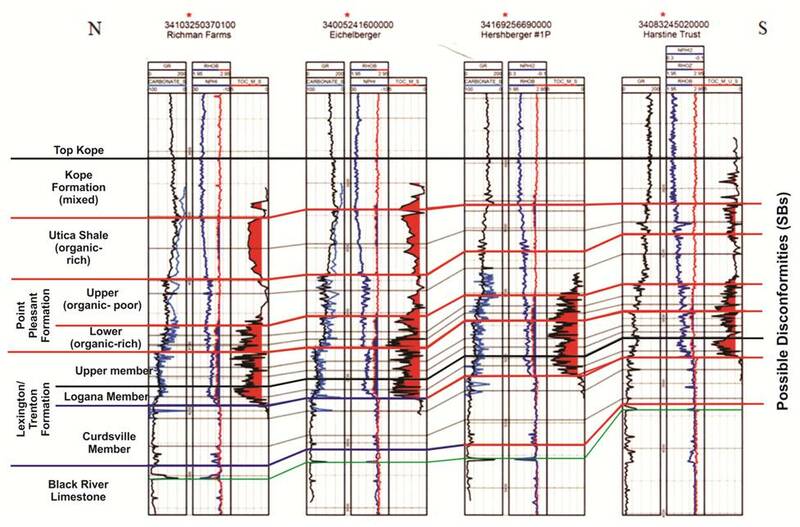 To supplement the core scans, an additional 92 downhole geophysical logs were digitized using Neuralog software. This provided a total of 162 LAS files, 124 of which include TOC data. The TOC data were manually entered as a unique curve to each corresponding LAS file and were limited to wells that had 15 or more TOC data points. When adding TOC data that originated from well cuttings to an LAS file, a midpoint of the cuttings sample interval was chosen as its corresponding depth. However, TOC data derived from core could be added to the LAS file at their exact footage. This combined dataset was imported into the Landmark GeoGraphix® software and displayed in crossplots for further analysis. 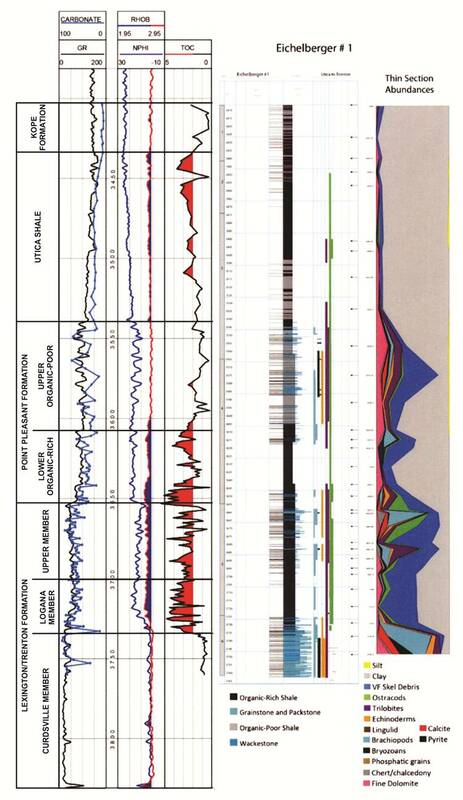 Correlations were made to analyze multiple aspects of the collected data, including which element is driving the overall radioactivity; how core SGR scans relate to downhole SGR; if GR, POTA, URAN and/or THOR relate to TOC; and what, if any, relationships exist among different facies deposited during Lexington/Trenton-to-Point Pleasant time (Patchen and others, 2006). We evaluated linear trends in data and refer to a correlation coefficient 'r'. These correlations are presented in the Section 5.1.5 below. ODGS completed the task of taking high-resolution photographs of core from the Upper Ordovician interval (including Kope, Utica, Point Pleasant, Upper Lexington/Trenton, Logana and Curdsville) in Ohio and equivalent core intervals from West Virginia, Kentucky and New York. Photographs were taken using a ceiling-mounted, full-frame, Digital Single Lens Reflex (DSLR) camera with an Auto Focus AF-S 24 – 70mm f/2.8 G ED lens. All photographs were exposed using color corrected 6000K light softboxes, creating consistent white balance. This consistency allows for a display of true colors that can be helpful when comparing core. When possible, both wet and dry photographs were taken for each core box to capture better detail. Fourteen cores were photographed for this task (Table 5-1). Core locations span approximately 600 miles (mi) across the Study area, from east-central Kentucky through Ohio, West Virginia and into central New York (Figure 5-1). Table 5-1. List of cores photographed and scanned with the SGL-300. Figure 5-1. Regional map of Utica/Point Pleasant well locations for which cores were scanned and photographed. Facies map of Trenton/Point Pleasant time from Patchen and others (2006). The Bender CG&E No. 1 (#139) well is located in Boone County on the margin between the Lexington Platform and the Utica/Point Pleasant sub-basin (Figure 5-1). This well is approximately 25 mi southwest of the Sky Valley well and 40 mi from the Howerton well. There were many aspects of this core that made it difficult to collect good data and perform accurate correlations. Prior to scanning, a significant portion of this core needed to be organized, depth-checked and oriented correctly. Various intervals of this core were missing, most notably the bentonite beds (Millbrig and Diecke) in the Black River. Once the core was organized, it was scanned with surprisingly good results. 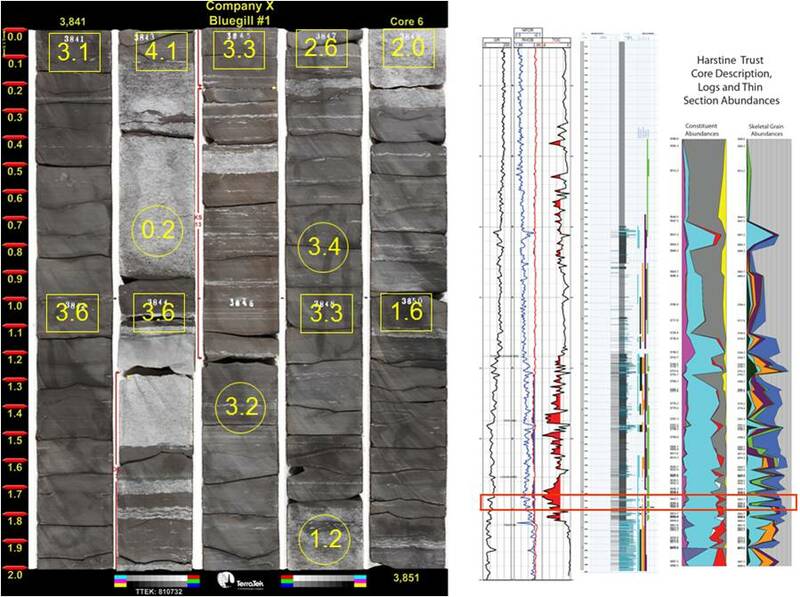 The core scan matched well with the downhole logs, which include the bentonite marker beds, allowing for a reasonable correlation to the Ohio Howerton core scan. The best correlation was made using the URAN curve and to a lesser extent the GR, POTA and THOR curves. Even so, potassium was still the most influential element with respect to increasing GR readings. The scanned core data were merged with TOC data, which facilitated further data analysis. The M. Burchell well (#209) is located in Montgomery County, farther south on the Lexington Platform (Figure 5-1). The SGR scan produced reasonable data because the core is in great condition, has good depth markings, and is largely intact. After creating the LAS file and adding TOC data, a reasonable correlation was made with the Bender well, which is about 75 mi to the northwest of the Burchell well. The intensity of GR in this core seemed to be affected mostly by potassium and, in some instances, uranium above the Kope. The TOC relationships are discussed further below. All but one of the Ohio cores containing Late Ordovician shale were located in the western half of the state. The Fred Barth No. 3 (#3003; Figure 5-1) is that exception, located in Coshocton County, just west of current Utica drilling activity. The Ohio cores were selected for scanning based on availability of additional data (e.g., TOC, wireline logs), location regarding facies and overall condition, which ultimately facilitated the correlation of these wells across the basin. There are two scans from cores in Butler County, two from Clermont, one from Coshocton, one from Highland, one from Marion and one from Scioto. The Butler County wells were mainly chosen based mainly on their locations in the Utica/Point Pleasant sub-basin, close to the eastern edge of the "Sebree Trough". The "Sebree Trough" is a narrow northeast-southwest-trending feature described by many as a clastic-filled depression, extending from western Kentucky through southeast Indiana into northwestern Ohio (Patchen and others, 2006). Both cores are relatively shallow and include only the Kope Formation. Core from the Valentine Apple well (#860) is in fair to good condition, but is missing intervals and showed inconsistent depth markings. In spite of this, a realistic LAS file was prepared. SGR data showed that a majority of the radioactivity was predominantly driven by the percentage of potassium in the Valentine Apple well. However, there were multiple intervals with more than 10 parts per million (ppm) thorium and uranium, which slightly increased GR readings. Interestingly, the uranium and thorium spikes were cyclical and offset from one another. As uranium increased, thorium would decrease to zero and vice versa. The second Butler County core (the Todhunter well, #3446) was chosen as a supplement to the Valentine Apple because they are situated only 900 ft apart. Core from this location is in poor condition and was very difficult to scan. There were missing intervals, varying volumes, and inconsistent depth markers, making it nearly impossible to synchronize with the scanner. An LAS file was created, but the accuracy of the data is suspect. In an attempt to salvage this scan, additional correlations and edits were made, but with little success. Two cores near the Ohio River in Clermont County were selected for scanning, aiding in the correlation with the southern region of the Study area. These Clermont wells, the Howerton (#2535) and Sky Valley Rec Club (#2536), were drilled by ODGS as stratigraphic tests in the early 1980s, and cores cut at these locations are continuous from the Point Pleasant down to the Black River Formation. They straddle the margin between the Lexington Platform and the Utica/Point Pleasant sub-basin (Figure 5-1). This margin line is somewhat tenuous but is based on the overall thickness of the Trenton Limestone (Patchen and others, 2006). Both cores were in excellent condition and provide a high confidence level in the SGR scans. 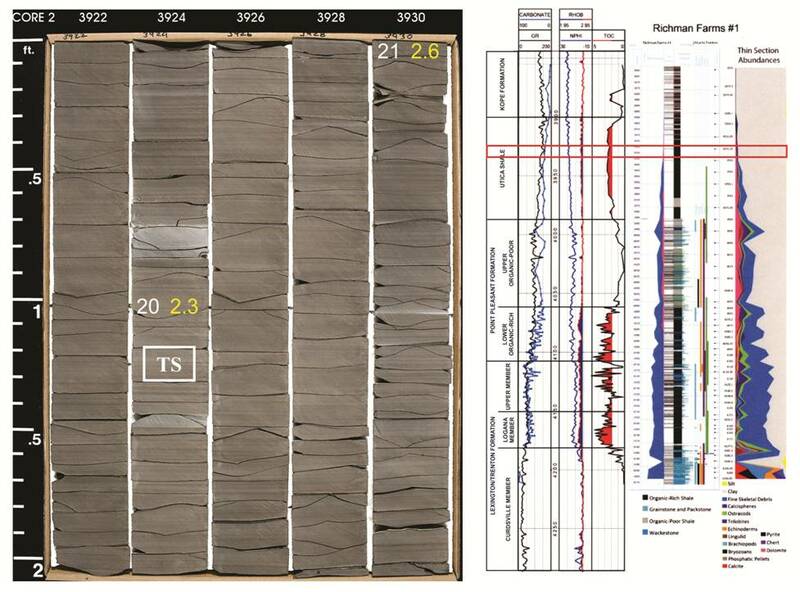 Each scan started in the Black River, logging multiple bentonite beds (the Millbrig and the Diecke; see Figure 3-1), which provided good stratigraphic markers. The Sky Valley Rec Club well, located on the sub-basin side of the margin, was scanned first and had intriguingly low (near-zero) GR readings throughout the entirety of the log. Little variation in log readings made it difficult to interpret and correlate, but the scan appeared to be accurate when checked against known calibration standards. 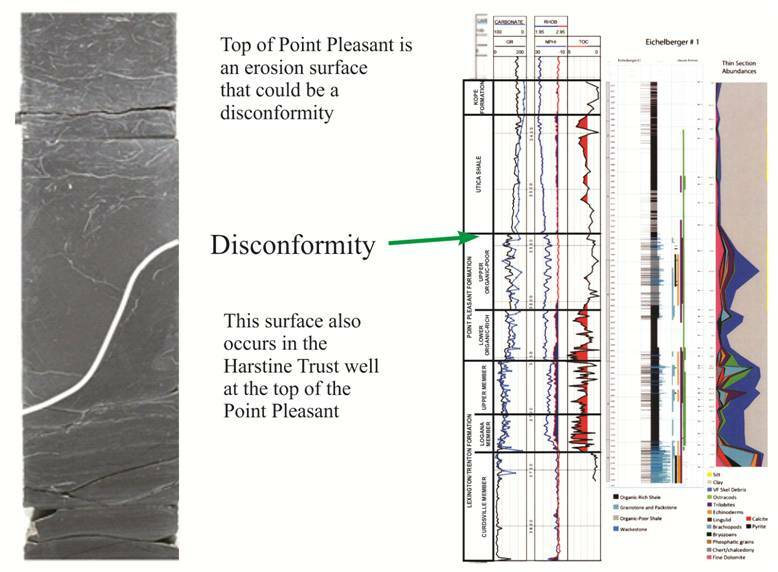 The scan also was compared to photographs and core descriptions, further confirming the data that indicate a good correlation between GR and increased shale percentage in the Point Pleasant. The scan revealed that the increase of GR in the Point Pleasant was a direct result of the increased potassium percentage. Scans from the Howerton well, located on the Lexington Platform side of the margin, had considerably different results, showing higher levels of radioactivity and a notable increase of uranium levels in the upper Lexington. Considering that these wells are only 20 mi apart, similar results were expected. This difference in scan data was investigated further by comparing the rocks in cores from these two wells. Overall these cores are very similar, with the only noticeable exceptions being the nearly missing Point Pleasant and the thinner, less radioactively-intense bentonite beds in the Howerton core. SGR data from the Howerton well were driven mostly by the percentage of potassium, considering that less than five ppm uranium or thorium were detected until the scan reached the upper portions of the upper Lexington/Trenton Formation. In this member, the most uranium detected was just over 10 ppm, but this did not cause a significant change in GR readings. Samples were taken from this core for TOC analyses, which are included in the LAS for this location. Thirty miles to the northeast of the Howerton well, in Highland County, the J. Goins well (#2626) was selected due to its pristine condition and paleogeographic location in the Utica/Point Pleasant sub-basin (Figure 5-1). There were few to no missing intervals, and the core had not been excessively split or sampled. The LAS file from the scan was compared to the downhole log and matched almost identically. The natural radioactivity occurring in this well is almost 100% from potassium percentage (Appendix 5-A). There are two small uranium-dominant horizons in the Kope but nothing more. Further data were collected for this well, resulting in a RHOB scan. The smaller diameter of this core presented a unique problem in gathering RHOB data. In order for the scanner to detect a change in density, the core had to be elevated on risers allowing it to sit closer to the cesium source. Overall, the scanned data from this well correlated very well with the nearby Clermont County wells. Core from this well differed in that it included the entire Point Pleasant and Kope intervals, which are not present in either Clermont County core. Samples were taken for TOC analyses, which were studied alongside the spectral/density log. The Aristech well (#3409) is located approximately 50 mi to the southeast of the J. Goins well on the Lexington Platform (Figure 5-1). This core was in very good condition with few splits or missing pieces, consistent depth markings, and an abundance of supplemental data, including TOC and wireline logs that can be used for evaluation. The LAS file from the scanned core was merged to the downhole LAS file. This merge clearly illustrated that the core scan was about seven feet shallower than the downhole log. This discrepancy is probably caused from mislabeled depths during collection or re-boxing. The original scan depths were maintained when adding the TOC data. Even though this well is located on the Lexington Platform, it encountered about 120 ft of Point Pleasant Formation. Once again, potassium and thorium were the main elements responsible for the increase measure of GR. There were no specific radioactive beds in this core that could be directly linked to an increase in uranium. The uranium content in this core was never measured above six ppm and hardly measured above three ppm. On the other hand, this well displayed some high levels of thorium, with multiple beds measuring contents of 30 ppm or higher. Additional evaluations were completed and are discussed in Section 5.1.5 below. The Fred Barth No. 3 (#3003) is located approximately 130 mi north of the Aristech well in Coshocton County near the center of the Utica/Point Pleasant basin (Figure 5-1). This core did not produce good SGR results due to its poor condition from over-sampling and missing intervals; approximately 50% of this core was missing when it was donated to the state. Attempts were made to scan the core and correct for missing intervals and changes in volume but with little success. These attempts were made because this is the only core available for study in eastern Ohio close to the current drilling activity. No useful SGR log data have been generated, but photographs were taken to illustrate the organic-rich intervals in this core. The Prudential well (#3372) is located in Marion County in the northern portion of the "Sebree Trough" (Figure 5-1). This core was a good candidate for SGR scanning because it is a solid core and has modern wireline logs, TOC, X-ray Diffraction (XRD), scanning electron microscopy (SEM) and source rock analysis data. Overall, the scan was successful, but there were some concerns regarding depth, likely due to original mislabeling during core collection and re-boxing. The mislabeled depths resulted in a 20-ft discrepancy between the core scan and downhole logs. As with the previous wells, the GR levels from this core were produced from the increased levels of potassium. Many beds had greater than 30 ppm thorium, and several had uranium levels slightly above 10 ppm, but neither uranium nor thorium caused significant percentage increase in GR. A major problem was still present regarding the TOC data for this well. Even with an understanding of the log discrepancies, there is no way of knowing which depths were used by the five clients who sampled this well for TOC. Therefore, the scanned data cannot be definitively matched with the TOC analyses performed for this well. The Power Oil well (#768) is located in Wood County in the southeast portion of the Utica/Point Pleasant sub-basin (Figure 5-1). Even though the Utica/Point Pleasant interval in this well is thinner than noted in the Aristech well, which is located on the Platform, it is considered to be located in the sub-basin due to the thinning of the overall Lexington/Trenton Formation. The data collected for this well were inconsistent because only a ⅓ slab of the core was available and sections were missing, which challenged the scanner capabilities. The data were converted into an LAS file and merged with the borehole geophysical LAS log and TOC data. Due to missing intervals in the Black River, finding good stratigraphic markers required extensive data manipulation. After several attempts to correct for the missing intervals and inconsistencies, we determined that further data manipulation would not be beneficial for this Study. Consequently, the scanned data were left in their original state, which revealed that the potassium percentage was still the most influential element to GR (Appendix 5-A (PDF, 77 MB; 131 pages)). The Lost River cores (#254 and #256) were drilled in 1977 as a part of the Potomac River Watershed Project, Floodwater Retarding Dam No. 27, and are located in the Central Appalachian basin near the Taconic Foredeep (Figure 5-1). Both cores include the Martinsburg Formation (Utica equivalent in part), are less than 100 ft in length, and are in very good condition. The scans were successful in gathering SGR data, but the short length and small shale volume limited their use. No additional data were available for these core locations. The New York Mineral test well (#74NY5) is located in Herkimer County in a deeper-water environment east of the carbonate platform (Figure 5-1). This slabbed core is in excellent condition with no missing intervals, which allowed for the collection of very good data. Overall, the GR was evenly influenced by potassium and uranium with very little amounts of thorium. The relationship, albeit weak, between URAN and GR for this well was not seen in any other well scanned for this task and may be a result of deeper-water deposition. The TOC data were added to the scan and additional correlations were made with Ohio, West Virginia and Kentucky core data. 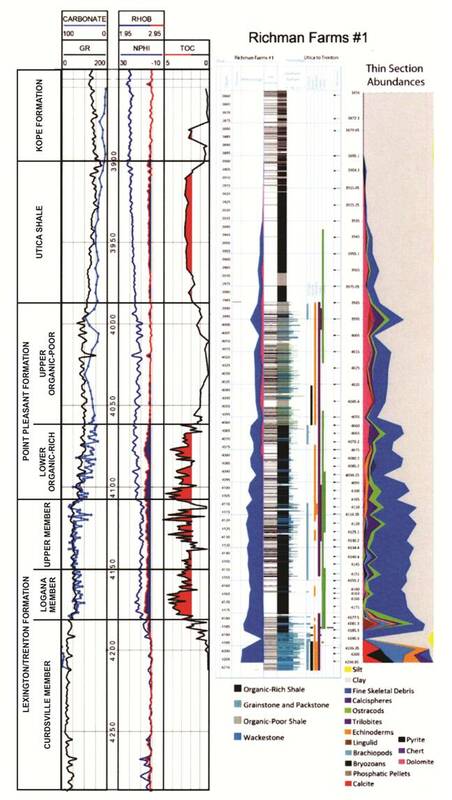 The GR log was the first nuclear well log used in industry and was introduced in the late 1930s (Schlumberger, 1997). This log measures natural radioactivity in API units, and is generally used as a correlation tool. The natural radioactivity in rocks comes from any of three elemental sources, uranium, potassium and/or thorium. Each element emits unique gamma rays with characteristic energy levels that can be measured using a scintillation detector. Knowing the amount of each element in a rock can help determine several features, but only depositional environment and TOC are discussed here. Knowing the origins of these elements and how they react in different environments is essential in determining depositional history. Uranium-238, the most common isotope of uranium, is naturally occurring in seawater at around three parts per billion (ppb). Disseminated uranium dioxides precipitate out of the seawater onto organic matter by forming organometallic complexes at the sediment-water interface under anoxic conditions (Swanson, 1960; Lunig and Kolonic, 2003). This implies that rocks with high uranium content may have been slowly deposited in anoxic conditions, allowing for extended time at the sediment-water interface, and consequently may be associated with elevated levels of organic carbon. In contrast, potassium and thorium do not occur naturally in seawater but are transported there for deposition. Potassium is most commonly found in clays or potassium feldspars. The clay materials associated with potassium are illites and smectites, which are chemically weathered from a parent material. Thick deposits of clays generally are a result of terrigenous, pelagic or hemipelagic deposition (Bohacs, 1998; Boggs, 2006). Potassium-rich clays are generally not associated with organic matter, but they may amalgamate and can be deposited simultaneously in lower-energy waters. Thorium is often associated with heavy minerals, such as sulfides, oxides and some silicates. These usually originate and weather from igneous parent material and are typically deposited in beach or alluvial environments, sometimes referred to as heavy-mineral placers (Boggs, 2006). Such environments are higher-energy settings that are generally oxygenated. Because organic matter is subject to oxidation and bacterial decomposition, it is unlikely that thorium and organic carbon would be concurrently deposited. Table 5-2. Correlation coefficients for each crossplot of GR, POTA, URAN, THOR, KTH, TOC and RHOB. * denotes wells that have density crossplots. The first step in our evaluation was to assess the relationship between the SGR core scans generated by the SGL-300 and the downhole SGR logs. The most notable difference between these is the total GR curves. The SGL-300 produces very consistent results because it was calibrated to the same set of standards at a constant gain setting on a daily basis, whereas the downhole logs were collected by different companies using different standards that are calibrated at various gain settings. The gain setting simply increases or decreases the amplitude of the GR signal. The SGL-300 gain is consistently lower than most downhole logs, but the overall signals are the same. Another difference, which is thought to be a product of scintillator resolution, is how well the radioactive elements are recorded. The SGL-300 uses a high-resolution scintillator that easily differentiates the radioactive gamma characteristics of URAN, POTA and THOR, whereas the scintillators on downhole wireline tools are not as good at separating the unique gamma signals. This is best observed when comparing the GR/POTA, GR/URAN and GR/THOR crossplots from any core scans to the same crossplots from a downhole well log. The best radioactive correlations from core scans are GR/POTA, which tend to show a strong to very strong relationship, whereas THOR and URAN show a weak to no relationship. Compared to the same GR/POTA, GR/URAN and GR/THOR crossplot correlations from downhole logs, all but one correlation is very strong. These differences need to be considered when using SGR data for further analysis. Acknowledging that core scans and downhole logs vary in resolution was important when determining which radioactive element was generating GR variations. For this part of our work, only data from the core scans were used. A multi-well analysis on the entire basin demonstrated a decreasing strength in relationship to GR from POTA to URAN to THOR. The POTA had the most consistent influence on GR with an overall core data r-value of 0.631, indicating a strong relationship. This relationship did vary among facies; the strongest occurred in the Utica/Point Pleasant sub-basin, on the Lexington Platform margin, and in the "Sebree Trough". The Prudential well in the northern portion of the "Sebree Trough" had the strongest GR/POTA relationship with an r-value of 0.890. This is likely due to the increased water depth and decreased energy in the sub-basin and trough. The weakest GR/POTA relationships occurred farther down on the Lexington Platform and in New York. The Burchell well in Kentucky had a moderate relationship (r = 0.464), and the New York core had a weak relationship (r = 0.250). The weaker relationship on the Lexington Platform is likely due to increased energy and carbonate percentage. The very low GR/POTA relationship in the New York core is different altogether and may be a result of its clastic source, which is unique to this location. The basin-wide GR/URAN core data multi-well relationship, although not as significant as GR/POTA, is still interesting. Of the three radioactive elements, uranium has the highest weight percentage influence on the total GR, allowing very small amounts to influence total radioactivity. This could be a factor in the overall weak GR/URAN relationship (r = 0.307) in Upper Ordovician shales. The statistical relationship varies from almost nil (r = 0.126) in the Power Oil well to moderate (r = 0.427) in the Prudential well. There are no prevailing trends among the different facies, but we argue that the deeper, less-oxygenated water in the “Sebree Trough” may play a role in statistical relationships we observed. The last radioactive element that influences GR is thorium. Based on the results of our work, however, thorium does not play a significant role. This is evidenced by the very weak relationship (r = 0.201) exhibited by our multi-well analysis of core data. Further, most wells evaluated in this task, with the exception of the Prudential, show no relationship, with r-values ranging from 0.055 to 0.134. The Prudential well has a weak GR/THOR relationship (r = 0.289). This may be due to a few beds with higher levels of thorium, but as a rule, only very minor amounts of thorium are present. Initially, all well data collected as part of this task were evaluated together to determine whether a relationship exists between Utica and equivalent GR signatures and TOC, but this approach provided unexpectedly poor results (Figure 5-2). The multi-well regression produced an r-value of -0.008. In addition to the lack of correlation, the regression line is negative. Generally, we would expect to see TOC increase along with GR. Investigating further, an analysis utilizing only the high-resolution core data still showed no correlation between GR and TOC (r = -0.014). The last evaluation of a potential multi-well GR/TOC relationship used data near the active drilling portion of the play, which includes eastern Ohio counties and northwestern Pennsylvania. Again, a negative correlation was derived (r = -0.099). In fact, there was a weak to no relationship for GR/TOC for all but four wells evaluated in this task. These wells (i.e., the Burchell, Mineral, Aristech and Prudential) displayed a moderate relationship. At this point, the Prudential well was eliminated from consideration due to its questionable core depths. Of the three remaining wells with a moderate GR/TOC relationship, only one had a positive correlation – the New York Mineral Core (r = 0.440). This could be a result of deposition of uranium and organic matter in deeper waters. Figure 5-2. Correlation crossplot for core gamma-ray (CGR) and TOC using all wells in the Study. Considering the GR signature is a composite of three radioactive elements, and no significant relationship was observed between GR and TOC, little correlation was expected when evaluating the relationship of TOC to POTA, URAN or THOR. The overall POTA/TOC relationship was weak (r = -0.251), when using the entire well dataset. An encouraging aspect was the negative regression, which made sense considering potassium has no real depositional relationship to TOC. The relationship was consistently weak even when evaluating only core data, active/inactive drilling areas, facies changes and each formation. Correlations were made for individual wells and varied from no relationship at the Richman Farms well (r = -0.070) to a weak relationship in the Aristech well (r = -0.384). The URAN/TOC relationship also was weak to nonexistent. The multi-well analysis using all data collected for this task had no relationship (r = 0.101). Similar to the POTA/TOC relationships, no matter how it was tested, the URAN/TOC relationship produced r-values of 0.001 to 0.237. One weak relationship (r = 0.237) came from the active drilling area test. An anomalously high relationship of r = 0.416 was observed from the J. Goins well, indicating a moderate relationship, but this was considered to be an artifact of having too few data points. The last radioactive element potentially related to TOC was thorium. Little relationship was expected between the two, and the results of our evaluation confirmed this. Using all the wells in the dataset, we observed no relationship (r = 0.122). In fact, only one well (the Georgetown Marine well, which is located in Belmont County, Ohio) showed a moderate relationship. Like the J. Goins anomaly noted above, we have interpreted the relationship reported for the Georgetown Marine well to be a result of a limited dataset. 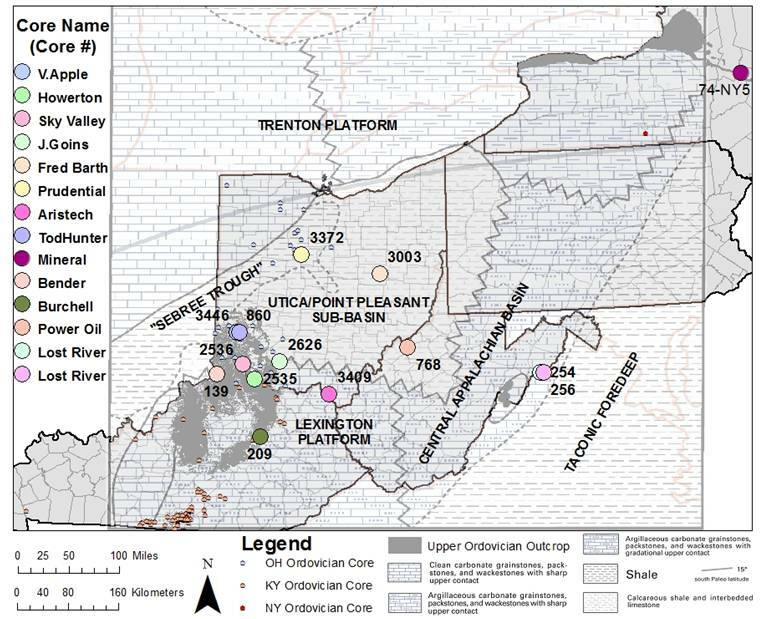 This work has demonstrated that GR/TOC and/or URAN/TOC relationships only develop in certain shale systems, and the Utica/Point Pleasant system in the Appalachian basin is not one of them. This may be due in part to the high percentage of carbonate present in these rocks. The Utica is described as containing 20% carbonate and the Point Pleasant 60% (Schumacher and others, 2013). Another reason could be position of the redox boundary relative to the sediment-water interface and/or length of depositional anoxic conditions. A number of factors could play a role in the weak relationships of GR, POTA, URAN and THOR to TOC, but suffice to say, none of these support the creation of a proxy for predicting TOC in the Utica Shale play. Although not part of the original SGR core scanning task, we have investigated the potential relationship of RHOB to TOC, given the disappointing findings of our SGR/TOC statistical evaluations. Bulk density relates to TOC because of the low grain density of organic matter, which can range from 0.95 to 1.6 grams/cubic centimeter (g/cm3). These are much lower than typical mineral grain densities, which typically vary from 2.5 to 3.0 g/cm3. The relationship is not constant, however, and can vary greatly with both organic type (Type II vs. Type III) and thermal maturity (Cluff and Holmes, 2013). Other variables that must be considered are amounts of pyrite, formation porosity and mass of organic carbon (Schmoker, 1993). The following are examples gathered in this study to show both the possibility and inconsistency, illustrating the localized analysis that needs to be done when predicting TOC. When using all well data for this analysis, RHOB/TOC exhibits a weak relationship (r = -0.304). However, when evaluating individual wells, much better relationships were observed. The best example comes from the Richman Farms well (Medina County, Ohio), which showed a strong RHOB/TOC relationship (r = -0.734). Other well correlations confirm this relationship and are included in (Appendix 5-A (PDF, 77 MB; 131 pages). During shale deposition, several factors play important roles in the preservation of radioactive elements and organic matter. The presence of potassium, uranium and thorium in shales can help determine the depositional environment(s) for the unit, as well as the likelihood that organic matter will be deposited. A good example of this is the Devonian Marcellus Shale, which has a good correlation among GR, uranium signature and TOC measurements (Cluff and Holmes, 2013). Unfortunately, the Upper Ordovician shales in the Appalachian basin do not exhibit this same relationship. The GR intensity for Utica and equivalent rocks is dominated by the presence of potassium, and there is no correlation with the amount of organic matter. Factors that may prevent such a relationship include, but are not limited to, the influence of carbonate material, the lack of available uranium in seawater, or the amount of oxygen in the system. This investigation clearly demonstrates that TOC does not directly correlate to any radioactive material in the Utica/Point Pleasant interval. Other methods may be better gauges for predicting TOC in the Ordovician shales, such as bulk density and/or the ∆log R method (see Meyer and Nederlof, 1984; Passey and others, 1990; and Herron, 1991). 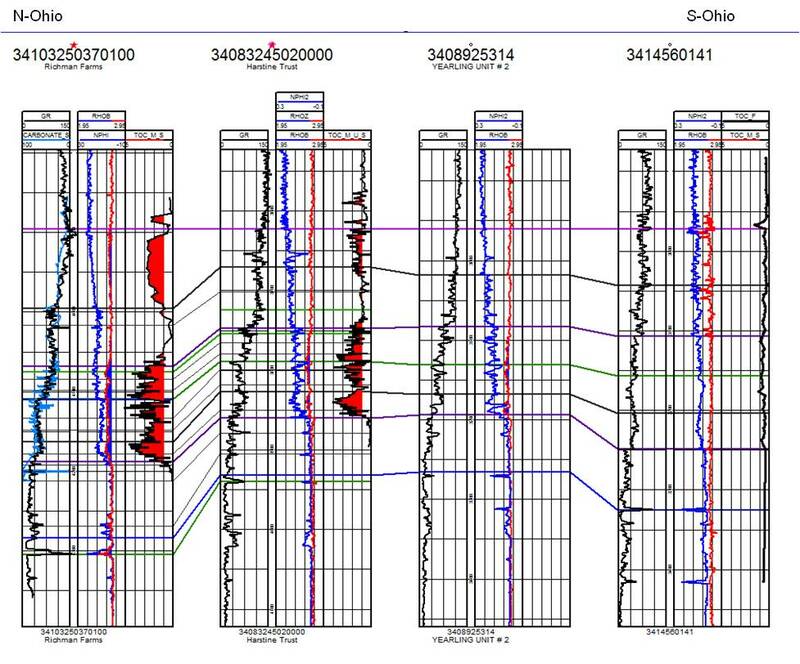 Devon Energy kindly provided access to five Ohio cores for description and analysis by Smith Stratigraphic LLC. Core descriptions, logs, core photographs, thin section descriptions and microphotographs, as well as TOC and carbonate content data, were prepared for these locations. The Devon wells are mainly in the western limits of the oil window, west of most of the current drilling activity, but the stratigraphy and rock types present are likely to be the same. Figure 5-3 shows the locations of these five cores. Figure 5-3. Map of Ohio showing the locations of five Devon Energy cores donated for this Study. 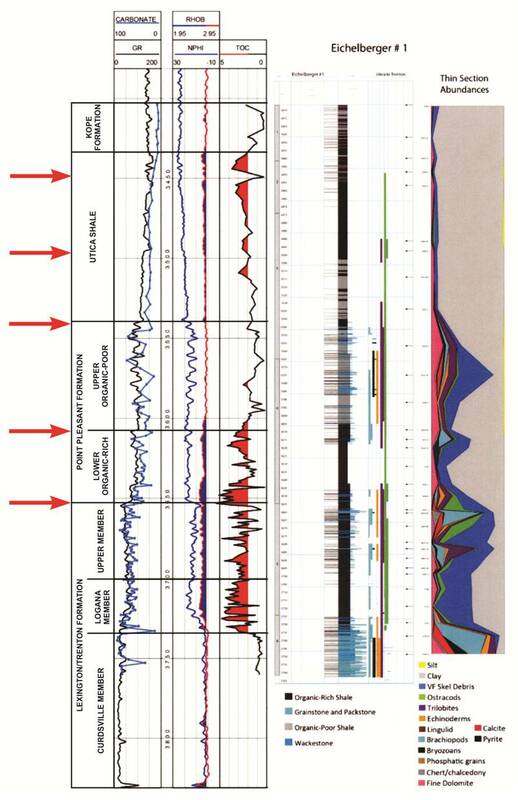 Figure 5-4 shows the relationships of the intervals cored in the five Devon Energy wells to the stratigraphic nomenclature used in the Study and by Devon Energy, and to organic-rich and organic-poor zones in the Study area. The Richman Farms, Eichelberger and Harstine Trust cores (Figure 5-5 through 5-7) extend from Kope down into the Curdsville Member of the Lexington/Trenton Formation. The Chumney Family Trust and Hershberger cores (Figures 5-8 and 5-9) are shorter and include mainly the Point Pleasant to Curdsville Member. 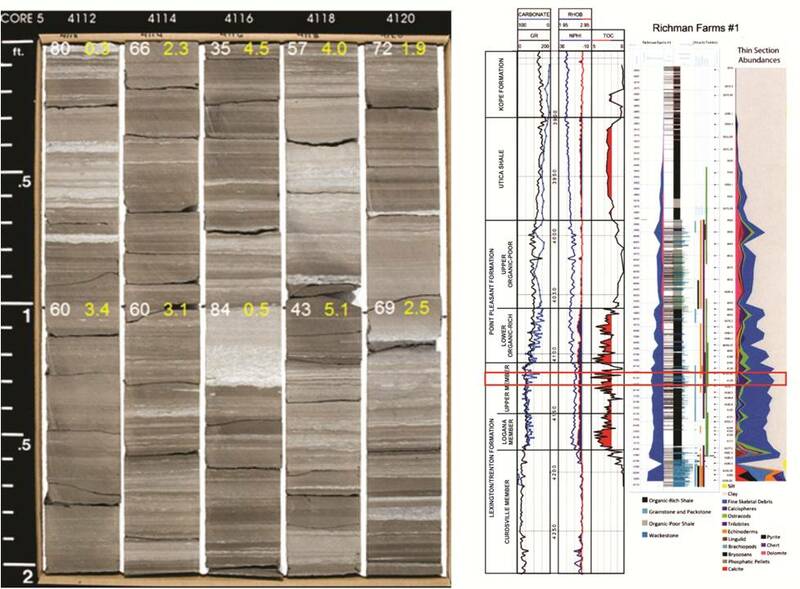 The following core displays (Figures 5-5 through 5-8) include the logs, measured carbonate content and TOC (at a spacing as low as one per ft), detailed core descriptions done at the cm-scale, and graphical presentations of the relative abundance of various rock constituents from thin sections. Figure 5-4. 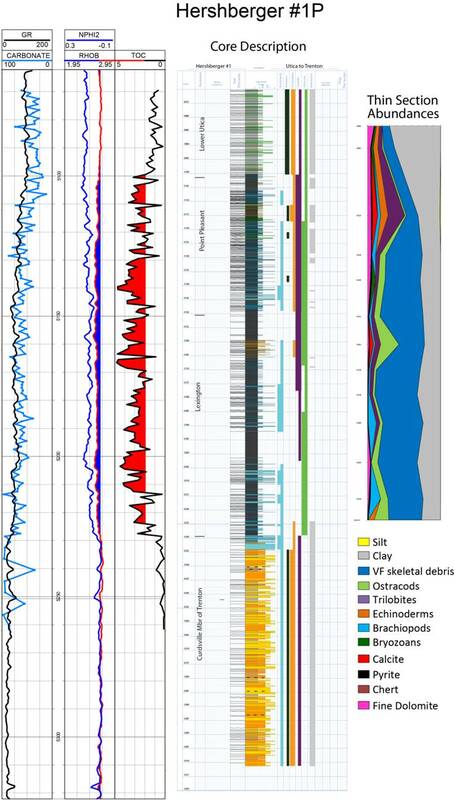 Comparison of Late Ordovician lithostratigraphic nomenclature used for this Study with organic-rich and organic-poor zones and cored intervals in five Devon Energy wells in Ohio. Cores include: CFT - Chumney Family Trust; H - Hershberger; RF - Richman Farms; E - Eichelberger; and HT - Harstine Trust). The organic-rich units in Figure 5-4 are shaded gray. The Kope Formation consists primarily of thin interbeds of gray and black shale. The Utica Shale is a black, organic-rich shale with higher carbonate content than the overlying Kope. The upper part of the Point Pleasant Formation is organic-poor, whereas the lower portion is more organic-rich. The upper Lexington/Trenton Formation and Logana Member are also organic-rich, whereas the Curdsville Member is organic-poor. Figure 5-5. Richman Farms No. 1 well with core description logs, carbonate content, TOC and thin section abundance. Figure 5-6. Eichelberger No. 1 well with core description, logs, carbonate content, TOC and thin section abundance. Figure 5-7. Harstine Trust No. 1 well with core description, logs, carbonate content, TOC and thin section abundance. Figure 5-8. Hershberger No. 1 well with core description, logs, carbonate content, TOC and thin section abundance. Figure 5-9. Chumney Family Trust No. 1 well with core description, logs, carbonate content and TOC. The initial step when trying to capture the rock types present in these cores was to make thin sections and describe them in detail. Although it is desirable to make a thin section every foot, or otherwise at a high frequency to capture all the variations, Devon chose a wider spacing for this work to manage costs. Each thin section was described semi-quantitatively using visual estimates of all the constituents present and the estimates entered into a spreadsheet. The rock constituents found include dolomite, very minor diagenetic anhydrite and chert, pyrite, skeletal grains, pellets, calcite, clay and quartz silt. A sample spreadsheet is found in Table 5-3. Table 5-3. Spreadsheet of data from the Harstine Trust well showing the relative abundance of various rock constituents. Figure 5-10 shows a graphical display of the main constituents from one of the wells plotted with the logs and the measured TOC. One of the more surprising things we discovered was the abundance of finely disseminated dolomite through much of the section in the cores. It averages about 7.5% and is most abundant in the Point Pleasant Formation. A second spreadsheet was generated for each thin section breaking down the relative abundance of each skeletal grain type. The skeletal grain types include bryozoans, brachiopods, phosphatic lingulid brachiopods, echinoderms, trilobites, ostracods and abundant silt-sized undifferentiated skeletal fragments. A sample of this spreadsheet is shown in Table 5-4. Figure 5-10. Harstine Trust No. 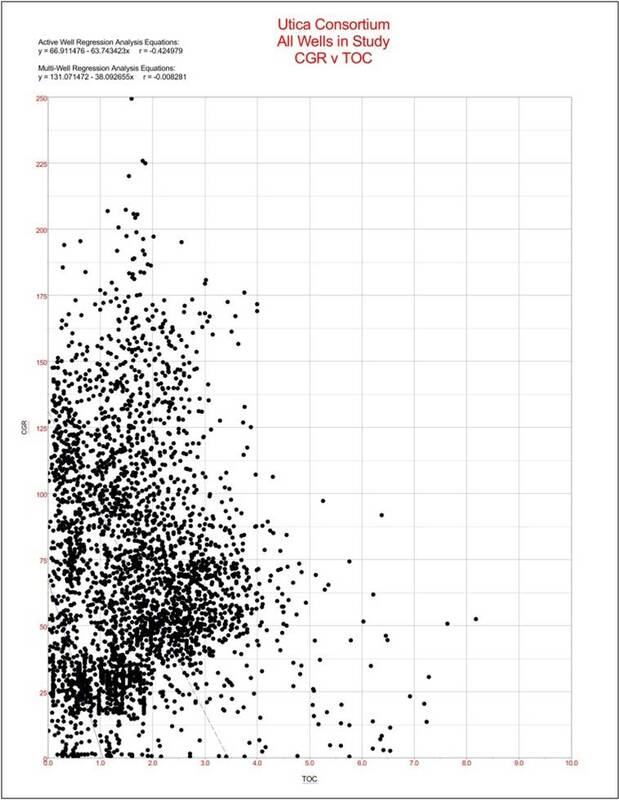 1 well with logs, TOC and plot of main constituents. Table 5-4. Sample spreadsheet of skeletal grain type relative abundance. The abundance of fossils present in these rocks indicates an environment that was well oxygenated much of the time. There are delicate trilobites and articulated ostracods that could not have been transported any significant difference. There also are beds composed almost entirely of strophomenid brachiopods, and this sort of monospecific accumulations of fossils is not likely to have been redistributed from some distant area. If they were transported from a different environment they would be more mixed with other fossils. Thus, these fossils likely lived and died in these locations. The silt-sized skeletal debris probably has been reworked; it is of an unknown origin. One interesting point is that there are abundant ostracods in the most organic-rich facies in the upper Lexington/Trenton Formation and Logana Member. There also are some trilobites but ostracods are the most abundant. These ostracods may have been planktic as there are a few species of planktic ostracods. They may have fed on the algae near the surface during algal blooms, or perhaps the sea floor was not anoxic during deposition of the organic matter. The presence of some other fossils that are known to be benthic within the organic-rich facies, plus the abundance of storm beds, suggests that the bottom may not have been anoxic, or at least may have endured frequent intervals of being oxygenated. Figure 5-11. Harstine Trust No. 1 well with logs, TOC, core description, main constituents and fossil abundances. There were no visible pores in any of the thin sections examined from any of these wells. This suggests that in the area studied there is no matrix porosity in the limestone. Any indication of porosity on the logs, therefore, is coming from the presence of organic matter, which has lower density, lower velocity and looks like porosity on the neutron logs. SEM photos of the organic-rich facies revealed little matrix porosity either. This also is the case in New York, where there are very few if any pores other than organic matter pores. If this holds true in the producing area, the only pores that are likely to be contributing much to hydrocarbon flow are the organic matter pores that formed during maturation. This would make the Utica very different from other liquids-producing plays, such as the Eagle Ford and the Bakken, which have a significant matrix porosity component. Key sedimentary features present in the cores that help understand the depositional environment include laminations, scour surfaces, burrows and apparent unconformities. There are laminations throughout almost all of the organic-rich shales and also in the clay-rich, organic-poor shales. The laminations were probably produced by moving currents rather than variations in suspended load. Schieber and others (2007) showed in flume experiments that laminations in shales can form due to migrating clay ripples on the sea floor. Because the sediments were 85% water when they were deposited, they compact significantly and any inclined cross laminations eventually will look like flat, planar laminations after compaction. Figure 5-12 shows a photograph with laminations that clearly look like ripple cross laminations down lapping to right. 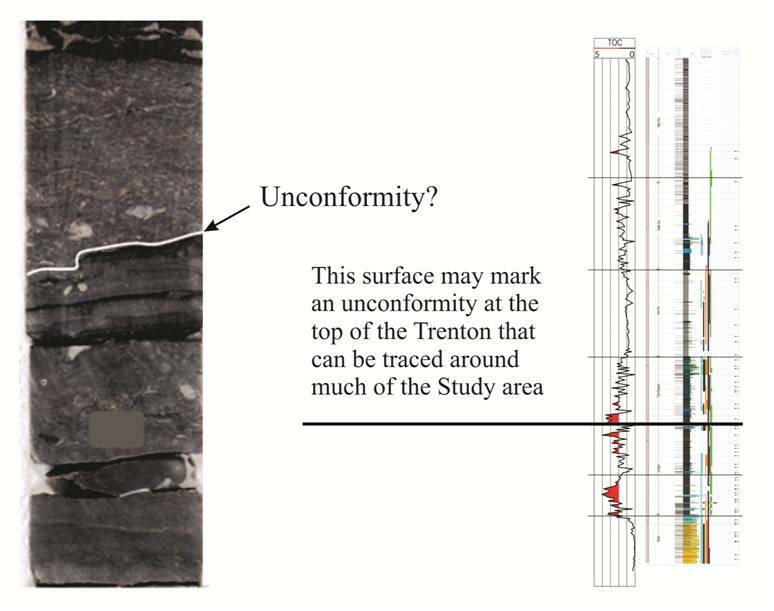 Figure 5-13 shows laminations in an organic-rich shale that clearly appear to have been produced by moving currents overlying a scour surface. Figure 5-12. 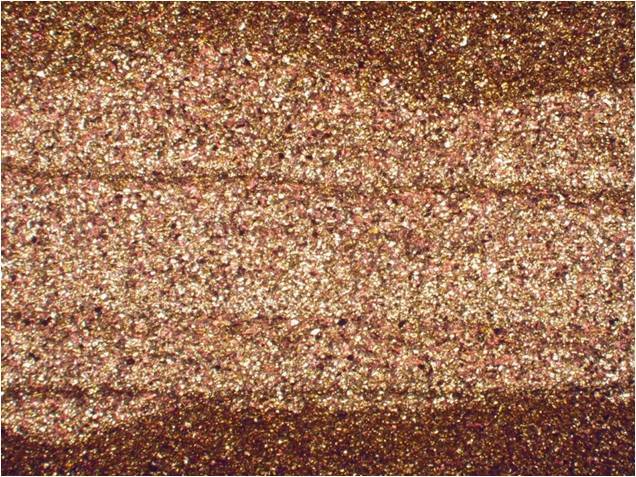 Thin section photomicrograph from the Richman Farms well showing ripple cross lamination overlying scour surface from Richman Farms well. Figure 5-13. 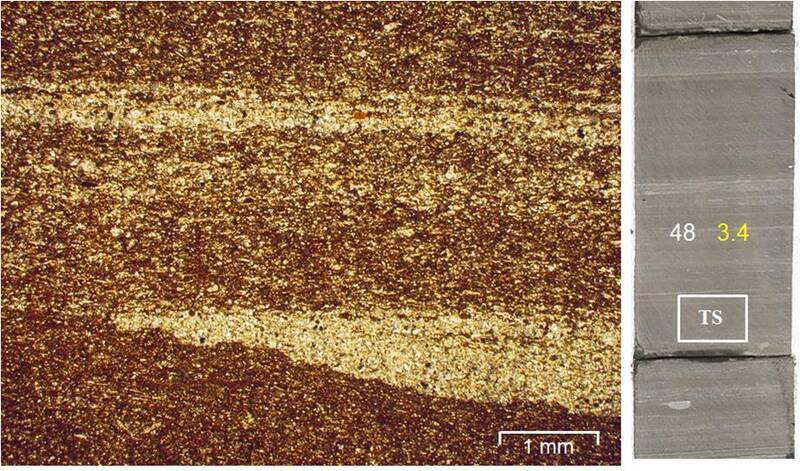 Thin section photomicrograph showing scour surface at base of slightly coarser bed in organic-rich shale. Scour surfaces are present throughout the studied interval from the Kope Formation to the Curdsville Member. They typically occur on top of finer shale facies and below coarser, grainier beds. These scour surfaces are surfaces of erosion that form due to an increase in energy. Given their frequency, which is sometimes down at the millimeter (mm)-scale, and definitely at the centimeter (cm)-scale, they probably are evidence of a storm-dominated shelf environment. This means that the organic-rich faces were being deposited and preserved in an environment that was being hit with frequent storms. Figure 5-13 shows a scour surface at the base of the grainier bed. Figure 5-14 shows an interval at the base of the organic-rich Point Pleasant and top of the upper Lexington/Trenton Formation composed of tens or hundreds of scour surfaces and probable storm beds. Burrows are common throughout much of the cored section. In some cases they are readily apparent in the slabbed cores, are approximately one-cm wide, and probably are Planolites or Thallasinoides. There also are some Chondrites burrows in the Trenton Formation, and there may be some very fine micron- (μm-) scale burrows in the organic-rich shale itself. Figure 5-14. Scour surfaces and storm beds in organic-rich shale and limestone of the Point Pleasant and upper Lexington/Trenton formations. White numbers are carbonate content, and yellow numbers are TOC values. "Top Lexington" indicates top of the upper Lexington/Trenton Formation. There are several horizons within the cored intervals that appear to be unconformities. 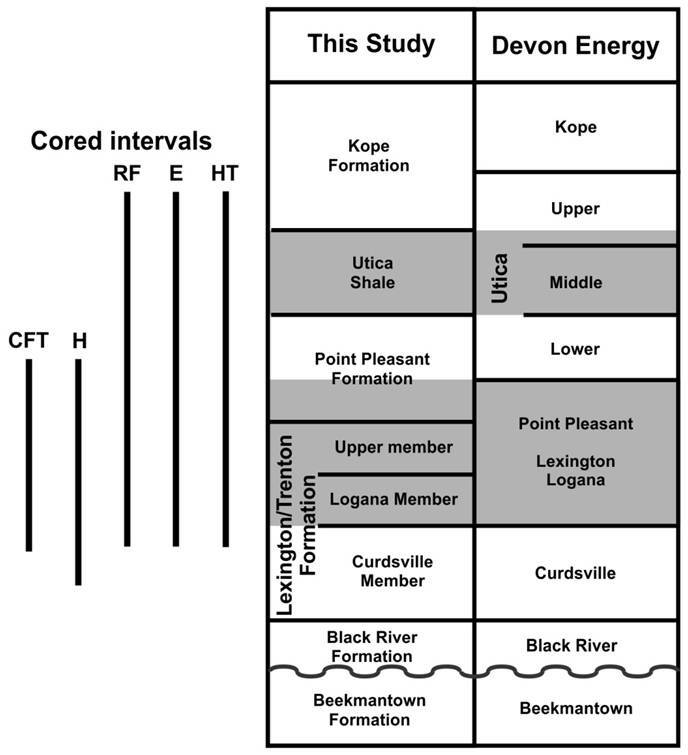 Two can be recognized in core by the presence of undulose surfaces: one is at the top of the upper Lexington/Trenton Formation, which is in the middle of the organic-rich zone (Figure 5-6); the other is at the top of the Point Pleasant Formation (Figure 5-15). There also are two log markers that look like sequence boundaries at the top of the lower, organic-poor Utica that can be recognized on logs and correlated for long distances. There are others throughout the section. For example, Figure 5-16 shows a surface from the top of the Point Pleasant Formation, and Figure 5-17 shows a surface from the top of the upper Lexington/Trenton Formation. Figure 5-15. 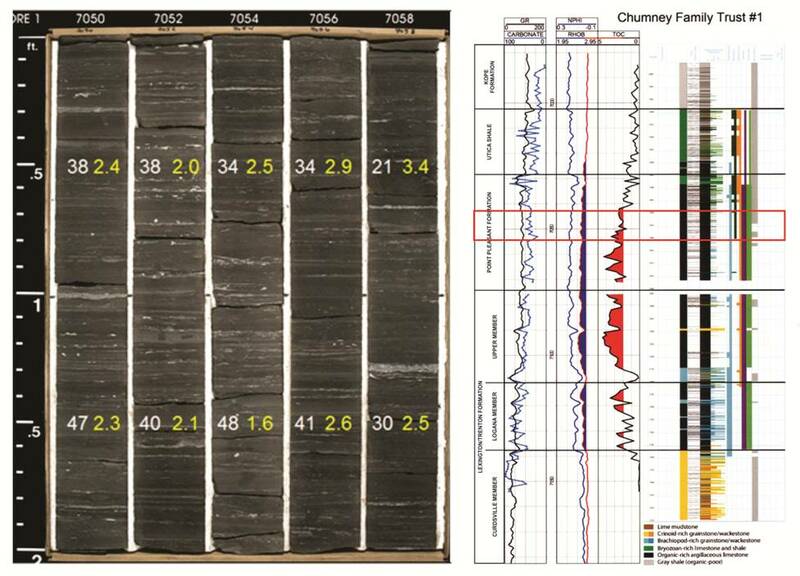 Logs, core description, and thin section abundance from the Eichelberger No. 1 well. Red arrows indicate possible unconformities in the Utica/Point Pleasant interval. These look like surfaces in the logs and, in some cases, in the cores as well. Figure 5-16. Photograph of a portion of the Eichelberger No. 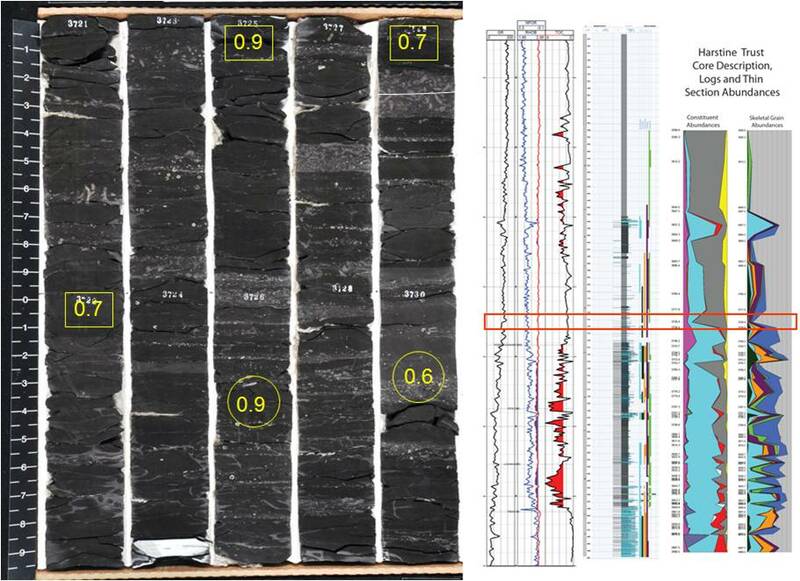 1 core with logs, core description and thin section abundance for comparison. The undulose surface occurs in the top of Point Pleasant Formation. This surface was also found in the Harstine Trust well core. Figure 5-17. Photograph of a portion of the Harstine Trust core showing an erosion surface at the top of the upper Lexington/Trenton Formation with organic-rich facies above and below. 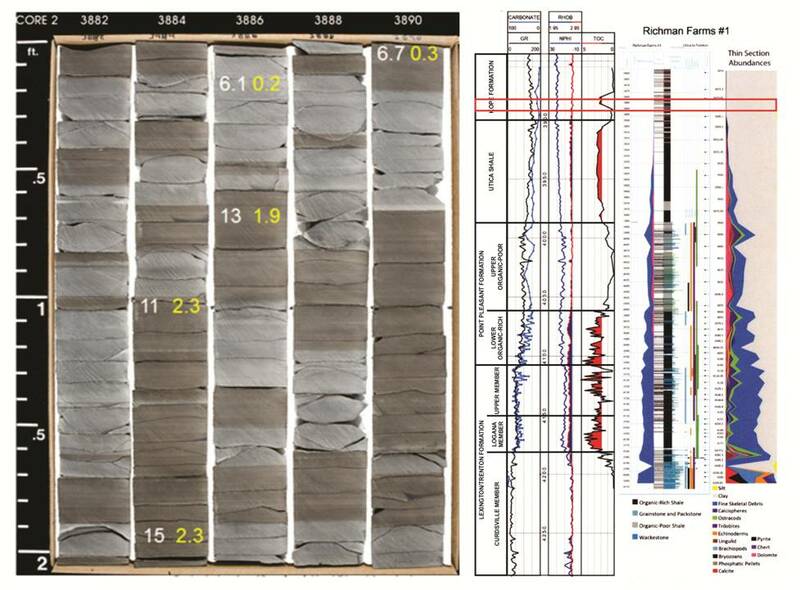 The Kope Formation is composed of gray shale and cm- to decimeter (dm)-scale interbedded black and gray shale at the base (Figure 5-18). The black shale can have TOC up to 3%. There are several tens of these black-gray couplets in each of the cores studied, with a sharp boundary below each gray bed and a slightly burrowed, gradational contact with the overlying black shales. Figure 5-18. Photograph of core of the Kope Formation from the Richman Farms No. 1 well showing thin beds of alternating black and gray shale. Gray units fluoresce. White numbers are carbonate content, and yellow numbers are TOC values. The Utica Shale is composed of calcareous black shale with TOC up to 3.5% (Figure 5-19). It typically has carbonate content of approximately 25%, which is higher than the Kope Formation but lower than the underlying organic-rich carbonate facies (Point Pleasant and Lexington/Trenton formations). It is laminated with very few of the storm beds found in the underlying units. The basal part of this portion of the Utica contains some brachiopod-bearing carbonate beds, as observed in the Harstine Trust core, which is to the south. Figure 5-19. Photograph of core of the Utica Shale from the Richman Farms No. 1 well showing laminated black calcareous shale. White numbers are carbonate content, and the yellow numbers are TOC values. The upper organic-poor Point Pleasant Formation is an organic-poor gray shale with abundant thin carbonate beds containing common Prasopora bryozoans (Figure 5-20). TOC is generally low (most samples <1%). This interval is considered to be primarily non-reservoir. It has abundant storm beds and a more diverse, open marine fauna. Figure 5-20. Photograph of core of the upper Point Pleasant Formation from the Harstine Trust well. Large visible fossils are mainly Prasopora bryozoans and large crinoids. Yellow numbers are TOC values. The Point Pleasant Formation is an organic-rich calcareous shale with some limestone beds. The organic-rich units have roughly 40-60% carbonate content with TOC up to 4 or 5%. This interval is apparently the target for drilling in most of the wells that have been drilled to date. There is a limestone at the top of the unit that is commonly picked as the top, but there is some organic-rich shale just above it. The Point Pleasant has abundant storm beds and clearly is a storm-influenced formation and also has common burrows, even in the organic-rich facies. Figure 5-21. Photograph of core of the Point Pleasant Formation from the Chumney Family Trust No. 1 well showing storm beds in organic-rich black shale. White numbers are carbonate content, and yellow numbers are TOC values. The upper Lexington/Trenton Formation appears to be capped by an unconformity in most wells and is more of an argillaceous limestone with limestone beds more common. 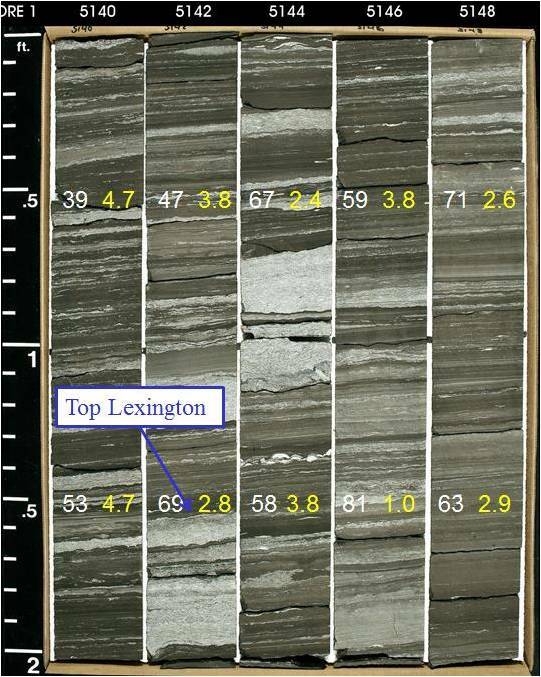 The boundary at the top of the Lexington/Trenton looks like an exposure surface or sequence boundary in several of the cores (see Figure 5-17). In some areas it is less organic-rich than the Point Pleasant Formation, and in other areas it has some of the highest TOC values in the interval. TOC varies with the limestone shale cycles but can be as high as 4 or 5%. 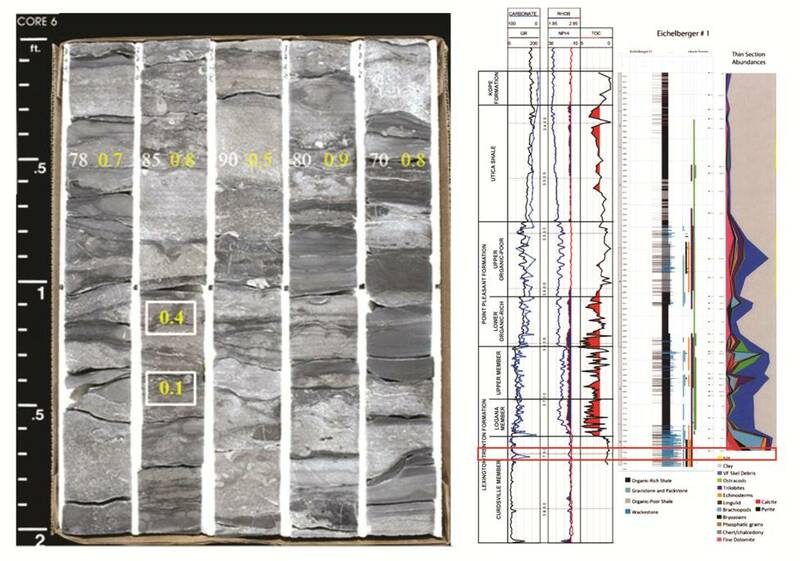 Figure 5-22 shows a core from just below the top of the upper Lexington/Trenton Formation that has abundant lighter colored limestone interbedded with a darker, organic-rich facies with up to 5.1% TOC. The interval just above and just below the sequence boundary at the top of the Lexington commonly has the highest values. The most common fossils in the organic-rich facies are ostracods, which may be planktonic, and trilobites. Bryozoans and crinoids become more common at the top of the Lexington/Trenton. Figure 5-22. Photograph of core of the upper Lexington/Trenton Formation from the Richman Farms No. 1 well showing abundant limestone beds with low TOC, interbedded with organic-rich facies with TOC up to 5%. White numbers are carbonate content, and yellow numbers are TOC values. The Logana Member of the Lexington/Trenton Formation is an organic-rich argillaceous limestone with TOC up to 5% and carbonate content consistently greater than 70%. It is laminated and has few limestone beds in the top and some well-developed, laterally extensive, brachiopod-rich beds at the base. These brachiopod rudstones are composed almost entirely of what appears to be a single species of brachiopod – some kinds of strophomenid. These brachiopod rudstones are interbedded with high-TOC organic-rich facies (Figure 5-23). The most common fossils in the organic-rich facies are ostracods that may be planktic in origin. Figure 5-23. Photograph of core of the Logana Member of the Lexington/Trenton Formation in the Harstine Trust well showing interbedded organic-rich, argillaceous limestone and organic-poor, brachiopod rudstone. Yellow numbers are TOC values. The Curdsville Member of the Lexington/Trenton Formation is a more typical Lexington/Trenton lithology with fossiliferous limestones and thin gray shale partings, and with little or no TOC in the shaly partings. There is a diverse marine assemblage including bryozoans, echinoderms, trilobites and brachiopods. It was deposited in a shallow marine environment. Figure 5-24 shows some typical Curdsville strata. Figure 5-24. Photograph of core of the Curdsville Member of the Lexington/Trenton Formation in the Eichelberger No. 1 well showing interbedded shale with lime grainstone and packstone. Yellow numbers are TOC values. Figure 5-25 illustrates a north-south correlation of four of the cored wells. It shows a very layer-cake stratigraphy, although the units thin slightly and becomes more carbonate-rich and less organic-rich to the south. At least eight cycles can be correlated through all of the wells. The red lines are possible sequence boundaries picked at log markers that in some cases can be linked to possible erosion surfaces in the core. Figure 5-25. 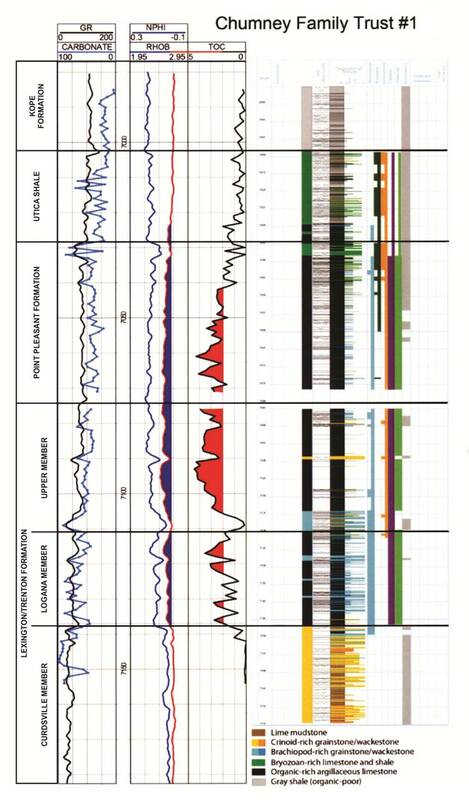 Correlation of four of the cored Devon Energy wells. See Figure 5-3 for core location map. Figure 5-26 shows a correlation that continues farther south tying the cored wells to some non-cored wells in southern Ohio. The thicknesses do not change much, but the TOC content has decreased and the carbonate content has increased. Figure 5-26. North-south correlation from northern OH to southern Ohio. Limestone content based on GR log is higher although the section is still shaly. The depositional environment of the Point Pleasant Formation, upper Lexington/Trenton Formation and Logana Member is a relatively shallow, probably <100 ft (<30 meters [m] deep, storm-dominated, carbonate shelf that experienced frequent algal blooms. Cross-sections show that there was not much difference in water depth between the organic-rich and organic-poor areas of deposition. The fossils present in the limestone suggest water that was at times shallow, exposed to sunlight and well oxygenated. The storm-bedding throughout suggests something well above storm wave base. The environment may have been subject to seasonal anoxia due to the frequent algal blooms. In New York and Pennsylvania, which were not studied in the same detail, a similar depositional model may be invoked.